MS PowerPoint never fails to surprise me. Recently I discovered a new feature; comments. What is so common in MS Word and Excel is rarely used in PowerPoint. You can add comments to a slide or an element in a slide. You might want to check that piece of info, point out a mistake or seek an explanation. The basic objective is to flag that slide or element on the slide for future reference. There can be a table on a slide which you have not quite understood. Just add a comment there and send the PPT back to the person who made it. If a team is making a presentation and all members are going to work on the slides one after the other (like group projects in MBA) then Person 1 makes a slide, adds comments where he wants Person 2 to take special care. Then Person 2 works on it and sends it to Person 3 with his comments (areas where he might want Person 3 to verify or check). 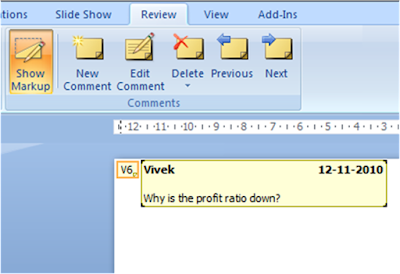 You can also use comments, when your colleague makes a PPT and sends it to you for review / feedback. How do you share your views on the PPT with your colleague? You write your comments on every slide. Better than typing all this stuff on the email, I guess. You cannot right click on the slide or on the text box to add comments. 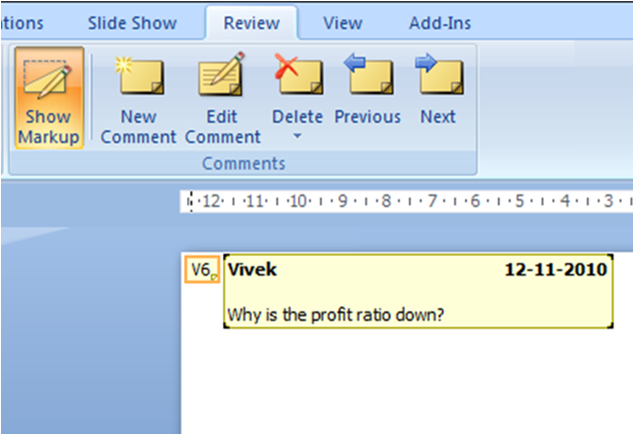 In PowerPoint 2007 you need to go to 'Review' tab -> Click on 'New Comment'. It adds a comment box to the slide. If you want to add comments to a particular text box, then click on the text box and choose 'New Comment' from the Review tab on the top. A comment box will be visible on the slide always. It will however not be visible in slideshow mode. To edit / delete comments, you just need to right click on the comment box and choose the option. Your friend sends you a PPT for feedback. If you have reviewed her presentation and added comments on 5 slides out of 40 do you want her to click on each slide and see if there is any comment on it? Your friend need not go to every slide and see if there is any comment on it. In the Review Tab, she can just click on 'Next' (see image below) and she can now easily move from one comment to another. So if Slide 1, 5, 9, 24 & 39 have comments, she can just click on the 'Next' option and she will be taken to these 5 slides one after the other. Isn't it wonderful! To me, who has been using PowerPoint for the last 7 years, this feature looks useful and wonderful. Did you know of this feature? Do you know of more such features in PowerPoint? Share it with all of us here.